Manager Derick Clutchey (far right) and members of YKK AP Baltimore Branch. Salesman Jim Darcangelo (left) with YKK AP America President Oliver Stepe (right). 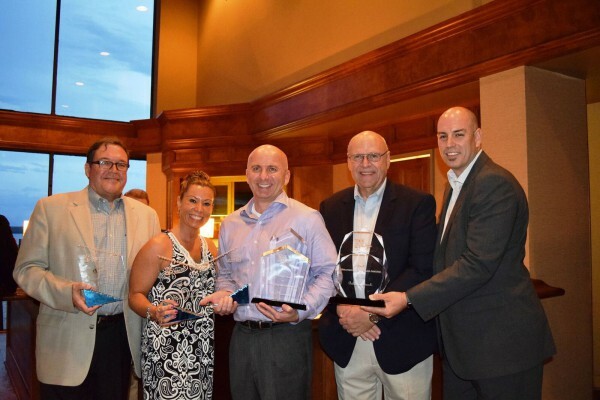 AUSTELL, Ga. (June 9, 2017) – YKK AP America recognized its top performers of 2016 during its annual meeting at Lake Lanier Lodge in Buford, Ga. The recipients were selected based on performance and growth during the 2016 fiscal year. Honorees included Baltimore branch manager Derick Clutchey, who received the coveted Branch of the Year Award and architectural sales representative Jim Darcangelo, who was awarded the company’s most prestigious individual honor, the President’s Award. The Branch of the Year Award recognizes outstanding achievements in sales, profitability, operations and customer service excellence. Clutchey, who manages the Baltimore team, accepted the award on behalf of the branch. 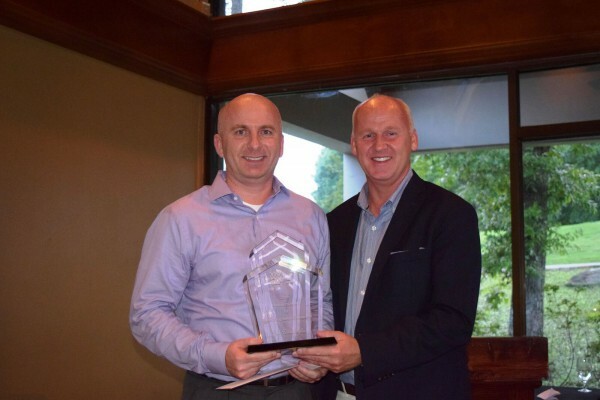 Darcangelo, also a member of the Baltimore team, was humbled to take home the President’s Award, which recognizes the company’s highest performing sales representative. “It is a personal goal every year to achieve this award, and it was quite an honor to be personally presented with the award by YKK AP’s president, Oliver Stepe. It was truly a collective effort amongst the Baltimore staff and a great and highly loyal customer base,” said Darcangelo.